Overseas charities like (RED) occupy a precarious position in China. A law enacted in January requires all foreign NGOs operating in the country to find government sponsors, register with the police, and submit yearly reports on their financing, plus jump through other hurdles. The regulations, which remain frustratingly vague, have sparked fear among nonprofits in China. Some worry that the government might use the rules as a pretext to kick them out of the country. 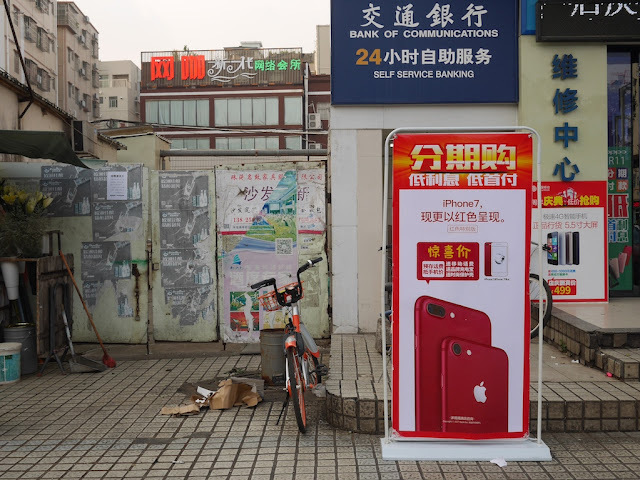 Shawn Shieh, a Hong Kong-based expert on Chinese civil society, says it’s possible Apple’s partnership with (Red) could be seen by authorities in China as incompatible with parts of the law. Apple hasn't publicly clarified the issue. In any case, it isn't hard to spots the localized promotions for the phone at stores in China. 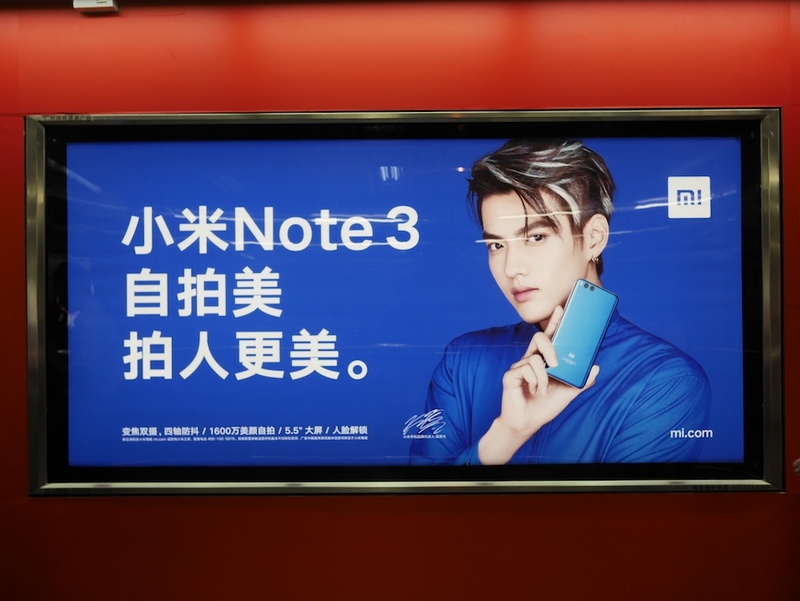 And now at some Guangzhou metro stations, and presumably many other places in China, it isn't hard to spot signs of a blue phone recently released in China — in fact, only in China. With a powerful 16MP front facing camera, it is clear that Xiaomi is really trying to capture the imagination of its beautify-addicted user base, as it was clear in their marketing for the phone. Crazy video packages and gorgeous models aside, the phone uses face scanning to find the different zones of face and provide more accurate (if that is even the word to use) changes to the user’s visage. Eyes can be pinpointed for enlargement, the chin can be singled out for easier slimming, and the cheeks can be airbrushed to remove spots, to name a few options. There are even different settings in order to add what could be described as “virtual makeup” to take it to the next level. Xiaomi even made a big deal about their new AI Beautify working for men just as well as women. Even though it makes less explicit mention of color, Xiaomi's marketing may be deliberately playing off people's awareness of the red iPhone, particularly in the Mi Note 3 ad with strong contrasting blue and red colors. 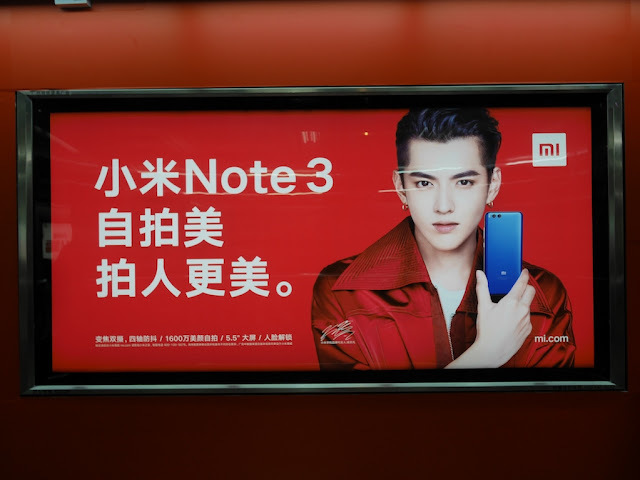 In any case, at the moment both Apple and Xiaomi likely face more direct competition from other companies, such as Huawei and Oppo. More about those companies and their promotions, colorful or not, another day.